It is now amply evident that India and Micro, Small and Medium Enterprises (MSMEs) are poised for a level of growth that defies normal trajectory. There is no better a time than now to leverage evolution of technology and its reach in order to make this growth inclusive, sustainable and beneficial to every entrepreneur. MSME’s biggest strength in the country has been their number and reach. Even though we find an MSME literally in every corner, it appears there was a concrete ceiling that prevented their growth beyond a certain scale. Limited access to credit and markets often pulled them back into survival mode. Any entrepreneur’s primary goal is to make products or services faster, better and cheaper. However, MSMEs in India have been largely focused on faster and cheaper products/ services, often cutting corners and leaving quality far behind. Millions of MSMEs have been focused on unmet market needs or areas where there are no large players or have been serving the larger organisations in a frugal way so that the latter can compete with the world. These MSMEs couldn’t think of providing better services and products, as costs were simply prohibitive, thanks to fierce competition among themselves. This was a huge limiting factor for their scale and growth. Good news is that things are finally changing and it is heartening to see MSMEs competing beyond cost. Thanks to technology, it is now possible for them to reach markets previously inaccessible and also unshackling one of their biggest hurdles i.e. access to credit. Earlier there were few and inefficient ways to find an entrepreneur who met your needs, but now new age startups, e-commerce unicorns, hyperlocal marketplaces are fast removing these barriers. This trend is beginning to give MSMEs fair opportunity to compete with new age startups and the best in the world, also becoming an education to them on how better quality also means better business. The biggest e-commerce players are now going beyond and solving credit needs of MSMEs, often providing them working capital based on their track record. This is an interesting by-product where everyone seems to benefit. MSMEs benefit from not worrying on how to pay electricity bills; e-commerce players and service aggregators benefit from a larger pool of sellers and consumers have a wider choice with better quality and price. With affordable technologies reducing their operating costs significantly, there is more good news for MSMEs. Ubiquitous, accessible mobile networks are also reducing communication costs and improving efficiency. Messaging services, mobile applications are giving MSMEs same advantage, on par with big players, of reaching large number of customers, tracking goods and services and listening to customer feedback at an unprecedented lower cost or often at no cost. This is a great learning for MSMEs on what really sells, what customers value most and what should be the lowest entry barrier for a new product or service portfolio. 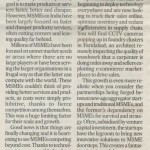 Operationally, MSMEs are beginning to deploy technology everywhere and are now looking to track their sales online, optimise inventory and reduce inefficiencies in supply chain. You will find CCTV cameras popping up in foundry clusters in Faridabad; an architect remotely inspecting the quality of woodwork that a carpenter is doing miles away and sellers exploiting e-commerce marketplaces to drive sales. This growth is even more realistic when you consider the partnerships being forged between new-age aggregator startups and traditional MSMEs, and the former’s dependency on MSMEs for survival and strategy. Often, subsidised by venture capital investment, the startups have the legroom to bring new innovative solutions to MSME doorsteps. This creates a fantastic win-win model. MSMEs stand to benefit from the sales, marketing and technology skills of startups while new-age startups benefit from the operational capacity and reach of MSMEs. These trends are beginning to expand in every sector; be it is hospitality, retail franchise, coffee chains or driving schools. There is more promise when new investment flows through smart cities, Digital India, financial inclusion plans, micro credit and, most importantly, power and energy when renewables pick up pace and make access more affordable and reliable. Each of these new schemes often comes with new money flow and a goal to impact large numbers in the shortest possible time. This is only possible when solutions can be delivered at scale; MSMEs are at that fulcrum to catapult these schemes from dream to reality.